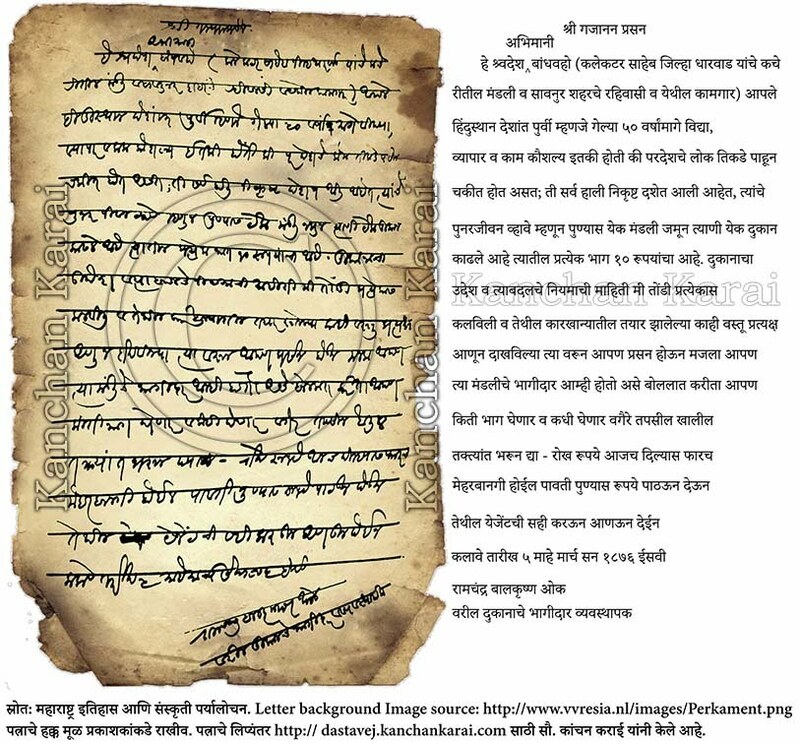 This letter is written in MoDi Script or मोडी लिपी on 5th March 1876 by Mr. Ramchandra Balkrishna Oak. Through this letter Mr. Oak has appealed all the staff members of the Collector office of Dharwad, residents and labours of Savanur city to become a shareholder by paying Rs. 10/- per share in a shop opened in Pune. In the beginning of the letter Mr. Oak addressed the recipients as proud brothers of the country. He further states for the last 50 years people in overseas countries were amazed to see the knowledge, business and skills in Hindusthan (India) but lately it is down rated. To resuscitate skills and business, a shop is opened in Pune by one team and each share costs Rs. 10/-. Mr. Oak reminds the recipients of the letter that when the objective of the shop and rules were orally told and products manufactured in the factory were shown to the proposed shareholders, they were pleased and said that they want to be a shareholder in the shop. Mr. Oak has attached a chart with this letter where proposed shareholders can fill the details like how many shares they want to buy and when. Mr. Oak says that it will a favor if the cash is paid today by proposed shareholders and he assures that he will send money to Pune and get the receipt with agent's signature. At the end the date is written and Mr. Oak has signed the letter by writing his designation as a Manager in partnership for the said shop. This letter has a connection with the first letter - An appeal to become shareholder.